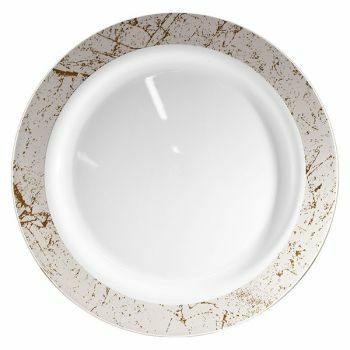 Product: 26cm/10.25” Strong White Plates with Silver Marble Effect – Pack of 10 was added to cart. Stylish and affordable, these White Plastic Silver Marble Disposable Dinner Party Plates will elevate any banquet, buffet or table arrangement. Made from quality food grade plastics, but with the appearance of fine china, these 9” dinner plates are finished in classic white to complement all colour themes and venues, and decorated with silver marble detailing that lends real designer appeal. Washable, reusable and disposable, these fabulous plastic dinner party plates are the perfect choice for weddings, birthday parties, corporate events, and family gatherings. Matching side plates and dessert/soup bowls available.